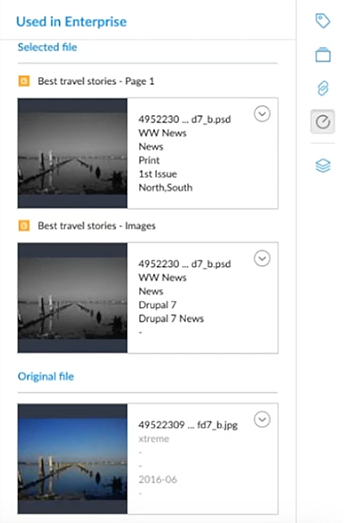 Elvis 5 can be tightly integrated with Enterprise Server 10 to make the assets that are stored in Elvis available in the workflow of Enterprise (for example by placing them on an InDesign layout or dragging them into a Dossier in Content Station). 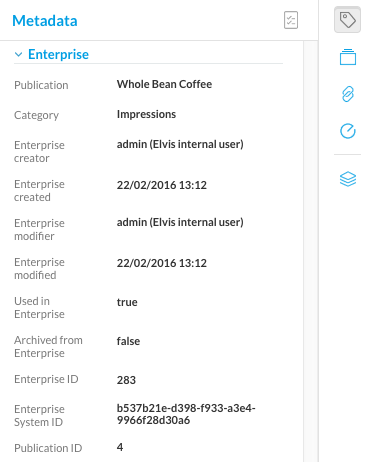 One of the ways in which the system can be configured is keeping the original asset stored in Elvis while storing a reference to that asset in Enterprise. Note: This reference is also known as a shadow object. 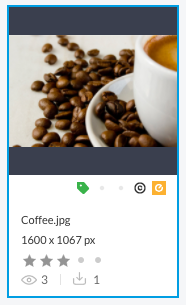 The thumbnail of the asset shows an Enterprise metadata flag. Enterprise metadata fields will show values, most importantly the field 'Used in Enterprise' is set to 'true'. Figure: When an asset is used in Enterprise, the Enterprise logo is shown in the thumbnail. Figure: Metadata properties contain detailed information about the usage of an asset in Enterprise. Figure: The Used In panel in the Elvis Pro client shows where in Enterprise an Elvis asset is used. 20 June 2017: Changed title from 'Using the Elvis Pro client of Elvis 5 to verify usage of an Elvis asset in Enterprise 10'.